Studying English at Teesside University led a talented student to see her work published by a major publishing house. Tracy Casling, 34 from Norton, was proud to have a chapter included in Comedy and the Politics of Representation: Mocking the Weak (2018) published by Palgrave Macmillan. The volume, edited by Tracy’s former lecturers Helen Davies and Sarah Ilott, explores the way comedy can be used to critique, undermine or reinforce stereotypes. Examining representations of the working class, Tracy argues that, unlike many comedies, 'This Is England ’90' (2015) does not demonise the working class. Her chapter comments on contemporary politics and neoliberal ideologies introduced by Margaret Thatcher, Prime Minister of the United Kingdom from 1979 to 1990. Tracy, who studied BA (Hons) English Studies, started the research in the second year of her degree. As part of the course, Tracy was asked to produce a research paper around representation and cultural identity, which she then presented at a student conference. After encouragement from a final-year student, Tracy decided to take her work further and submitted an abstract for the book. Tracy credits the broad range of topics on her degree course with her success. 'Unlike many literature degrees, English at Teesside University allows you to explore many different pathways,' Tracy said. 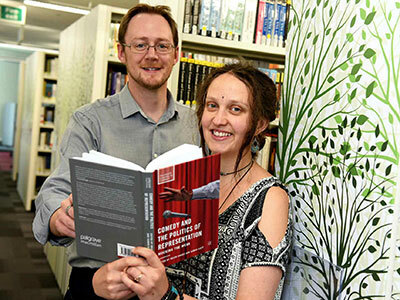 Dr Rob Hawkes, Principal Lecturer in the School of Social Sciences, Humanities & Law, also has a chapter in the edition which looks at 'Stewart Lee’s Comedy Vehicle' (2009-2016) and the way his comedy asks questions of the trust of the audience. As module leader on the course, Dr Hawkes was particularly delighted with Tracy’s accomplishment. 'We are incredibly proud that Tracy has published work. Many don’t publish their work until they reach PhD level, so it is a great achievement that Tracy’s work from the second year of her degree has been published,' he said.